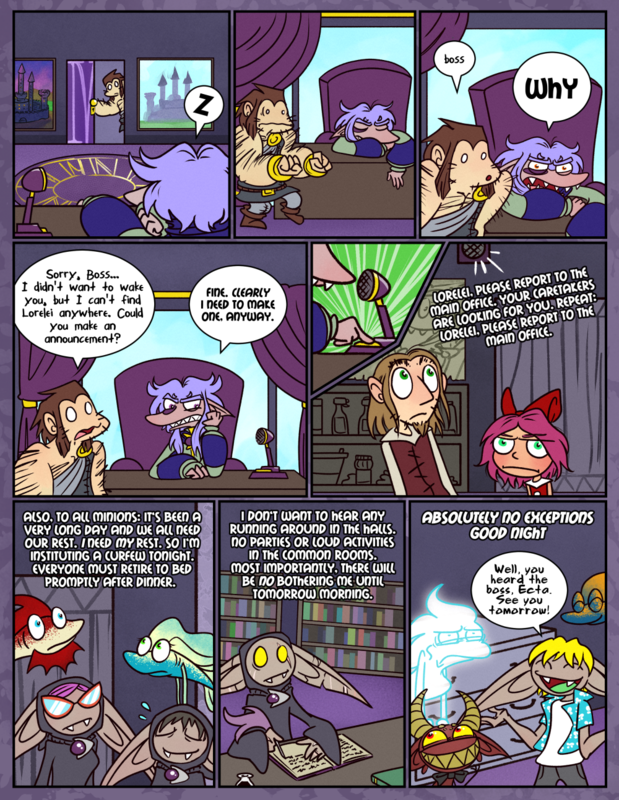 It’s been an EXTREMELY long time since the last comic with Lorelei in it. Y’know, one of the main characters? Prequels!! Oh Cyril is here too. Also… Saturday is my birthday. Cammy actually gets to sleep for once in her life, I’m so happy for her. Not as happy as Davis is about all this though. He has wonderful teeth! My response to the Floyd in last panel: “Good luck with that”. One minor bit of art critique, if I may: that door in the first panel could use a bit of perspective to it, I feel: right now it looks less like it’s being swung open than that it’s being pulled aside, like a curtain, to my eye. Yeah, I have STRUGGLES with doors, haha. I need to figure them out one of these days. Thanks for pointing it out! I added those paintings to spice up his office when I was remaking chapter zero and now I have to put them in every time. Worth it, though. As to the doors, it’s my pleasure! ^_^ If your drawing software has a “perspective tool” (or similar), that might allow you to get the basic distortion correct, after which you can paint over to get the line-width right or remove any other issues incurred. The paintings you can surely just copy-paste in most cases, I would think. Better in a closet than on a train. Paintings of the castle he regularly goes into to steal the princess. Wonder how long those have been there, the family has been in the villain business for generations. That third panel is me on my day off, EXACTLY. The last thing you should EVER do is wake up someone on their day off before they’re damn ready to wake up! Ooooo… Lorelei got called to the principal’s office! Lorelei you look so grumpy!